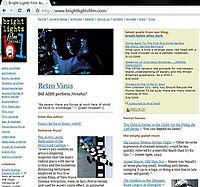 Bright Lights Film Journal is an online popular-academic film magazine, based in Oakland, California, United States. It is edited and published by Gary Morris. Originally a print publication established in 1974, it was discontinued in 1980 to be restarted and re-discontinued in 1993 and 1995 respectively. The magazine moved to online publishing exclusively in 1996 and has continued publication ever since. It is indexed in academic research databases such as MLA (Modern Language Association) ProQuest and the Film & Television Literature Index. In 2009, select interviews from the journal were compiled in a print anthology, Action! : Interviews with Directors from Classical Hollywood to Contemporary Iran, published by Anthem Press as part of its "New Perspectives on World Cinema" series. ^ Film & Television Literature Index: Coverage list. This page was last edited on 30 August 2017, at 07:50 (UTC).